Tim used the proceeds of the sale of his first e-commerce venture, FoodScrooge.com, to fund Carnivore Club, a subscription service that curates a monthly box of gourmet cured meats (packaged in a faux wood box that looks like a cutting-board) for customers in Canada, the U.S. and, most recently, the U.K. The idea of a monthly mail-order box of goodies—whether fruit or chocolate or leather-bound books—has been around for generations. But the Internet, with its unlimited, multi-dimensional possibilities for outreach and marketing, has conferred super powers on this business model, transforming it into a different creature altogether from your Aunt Sally’s fruit-of-the-month club. Yahoo asked the founder and CEO of Carnivore Club, which launched in 2013, to outline the top five advantages of the subscription commerce model for aspiring entrepreneurs hoping to enter the fray. Here’s what he told us! 1) This is the easiest online business model to operate: a one-size-fits-all box, sent out once a month. Easy was what Tim Ray was looking for. Artisinal producers provide their meats for the box at cost in exchange for the free publicity and potential new buyers. (To avoid international regulatory complexities, Carnivore Club only works with distributors who are already importing whatever product they want to feature in the box.) The company has built both its identity and cachet on a video marketing campaign, initially designed to appeal to the same demographic of unapologetically bromantic consumers who love Judd Apatow films nearly as much as they love roasting meat on a stick. The evolving suite of videos promote a corporate image that’s goofy, at times sexist and always outrageous. 2) There’s limited margin erosion from price competition. “It’s very tough to commoditize a curated subscription,” says the top Carnivore, “even when boxes in the same category offer different monthly offerings.” In other words, through careful choice of what goes in the box, subscription commerce entrepreneurs are able to protect themselves from copycats who might try to offer similar products at a cut-rate price. “Entrepreneurs are able to add value in their ability to curate amazing goods and build trust.” The Internet adds value by providing a free marketing platform with unlimited outreach for the brand. 3) The subscription box model caters to fans of the four-hour work week. 4) Cashflow problems are minimized. 5) The subscription commerce model is, according to Tim Ray, lots of fun. We asked Tim what made him decide on cured meats, rather than something else—for instance, something he might be able to procure for free rather than simply at cost—for his product line. It turns out that he wasn’t a particularly savvy consumer of salumi before he started Carnivore Club, beyond a fondness for trendy Toronto hot spots where he enjoyed ordering a charcuterie board with a pint of beer or a glass of wine. “I approached the business as a fan rather than a critic,” he told Yahoo. That approach, however, was informed by all the solid business knowledge this up-and-coming entrepreneur had already acquired. 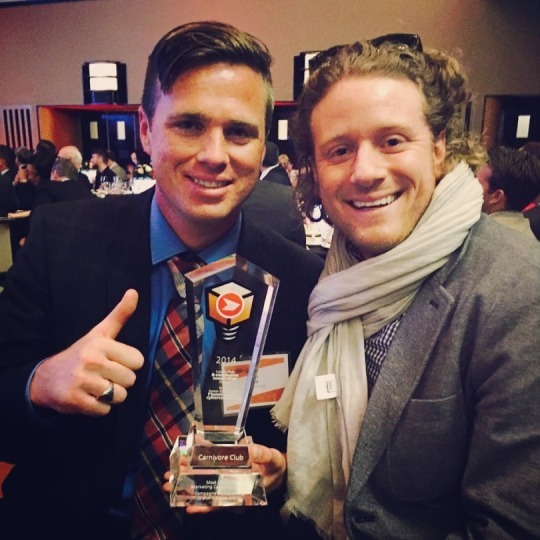 “As far as e-commerce goes, cured meats is the unicorn of categories,” he told us with more than a little glee. It’s a no-brainer when laid out so clearly: These requirements ensure that the ecommerce business owner will offset the costs of shipping, maximize profits and be able to compete successfully with any version of the product that might be available locally. For those readers who are taking careful notes, Carnivore Club works with Postage Pirate for their US business and Ship Station for their Canadian customers. Focus for the First Two Years: Marketing! 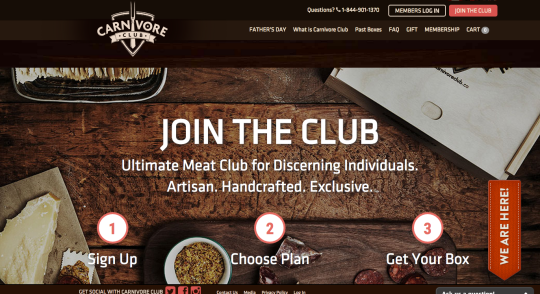 Tim Ray worked with digital content agency Ovu on a video to launch Carnivore Club’s crowdfunding campaign, which was designed, says Tim, primarily to promote the new company’s visibility (rather than as a way to raise capital, which was already in place). The resulting product, “Carnivore Club Man versus Vegan,” was seen by some as going well beyond edgy and funny into the decidedly un-P.C. realm of sexist and sophomoric. “The video created quite the stir,” says Tim, adding that he still laughs every time he shows it to someone. “We decided to stay away from the gender stereotypes for future videos—because we didn’t want to alienate women. It was just supposed to be satirical. The company upped the ante on their no-holds-barred humor with a particularly goofy, X-rated video and even a fake but functional website created by Canada’s BenSimonByrne agency. Tim stresses that they were careful not to offend women this time. “At the outset,” he told us, “our guess was that we were going after an affluent urban male consumer base.” And then the reality set in that women enjoy every kind of fine food just as much as men. Even though well over half of Carnivore Club sales are gifts for men, most of these are bought by women. Tim says that he’s walking a fine line between the irreverent humor he and his business partners favor—and everything he ever learned in business school about about how to market a luxury premium brand. According to its CEO, Carnivore Club currently ships two to five thousand of its gourmet boxes of cured meat every month—which, at the upper end, translates to $3 million in sales per year.